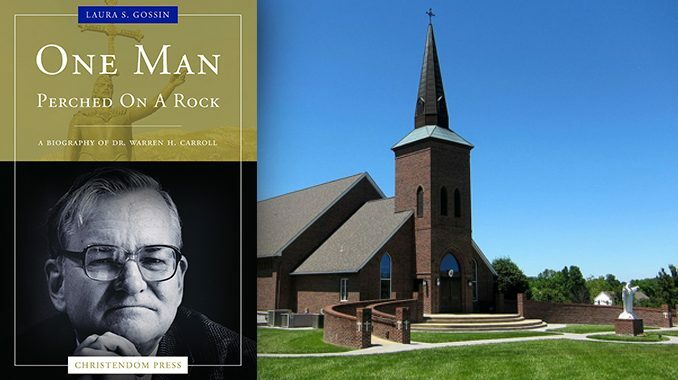 Laura S. Gossin’s biography, One Man Perched on a Rock: A Biography of Dr. Warren Carroll, is an engaging account of conversion, belief, struggle, and love. Many Catholics looking for a bit of summer reading might be tempted to pass over Laura S. Gossin’s offering, One Man Perched on a Rock: A Biography of Dr. Warren Carroll, perhaps wondering just who this Carroll character might be or, if aware of Dr. Carroll’s preeminent role as founder of Christendom College and his scholarship on Catholic history, concluding that since they no connection with the College they will have little interest in its founding or its founder. First, this very readable book presents yet again proof for the proposition that while every fall from grace may be boringly similar, every conversion to Christ is refreshingly unique. In Carroll’s case, it is a uniquely American story. He was born and raised in ‘Yankee’ Maine in a culture still steeped in a morality of natural virtues such as thrift, prudence, and civic duty derived from its Puritan and Calvinist founders, yet stripped of the theology and religiosity thereof. Inheriting from both parents a passion for reading, storytelling, and intellectual pursuit Carroll was repulsed by what he termed the ‘fundamental skepticism’ – what today we might call the secular humanism – he encountered upon entering graduate school at Columbia. He bounced through the anti-communism of the Cold War, passed through a dalliance with the Objectivism of Ayn Rand and a flirtation with the Puritanism of his Maine forebearers, before undergoing a seemingly rapid conversion to Catholicism just a handful of months after marriage to his beloved wife Anne. Second, as well as telling Carroll’s personal story, One Man Perched on a Rock also illuminates one of the more vexing debates rumbling in Catholic circles these days, that surrounding the so-tagged Benedict Option. Roughly forty years before Rod Dreher would raise awareness of just how Christians might respond to a culture for which an extreme conception of liberty serves as the lodestar for a descent into decadence, Carroll grappled with the descent just as it was picking up steam. Central to Carroll’s intellectual development in this regard were the minds and personalities involved in the production of the magazine Triumph, which sought to bring a Catholic perspective to the intersection of religion and politics in U.S. society. This included such men as Dr. Frederick Wilhelmsen of the University of Dallas; Dr. Bill Marshner, who would later serve as one of the founding faculty members of Christendom College; and L. Brent Bozell Jr., perhaps best known at the time for his association with his brother-in-law William F. Buckley and Buckley’s National Review. 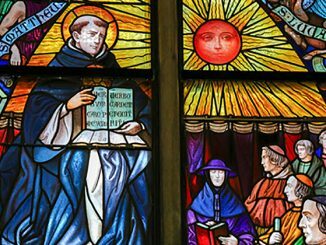 Surveying the destruction of those years, Carroll opted for the Benedict Option and founded Christendom College. And while the economic revival of the Reagan years, the spiritual revival of the papacy of St. Pope John Paul II, and the fall of the Soviet Union may have masked for a time the further descent of Western Civilization into madness begun in those years of 1966-1976, there can be little doubt that if Carroll was ahead of his time, he was only slightly so. Which leads to the third reason One Man Perched on a Rock should be of general interest to faithful Catholics, to wit: in documenting the founding and growth of Christendom, Gossin presents us a case study, an archetype, of the struggles and pitfalls and, ultimately, the providence of God’s grace in undertaking any true apostolate. Indeed, reading the book brings to mind so many similar stories which should be familiar to us: the seeming improbability of obtaining the necessary resources for the undertaking (think of the story of Mother Angelica and her purchase of the necessary equipment to launch her television network); the inevitable personality conflicts inherent in any human endeavor involving committed, strong intellects (think of the scene from scripture of the falling out between Paul and Barnabas); and the almost fly-by-the-seat-of-your-pants approach intrinsic to any venture in which the odds of success are minimal (think of that ragtag fleet of Italian merchantmen and sloops sailing out to meet the Muslim armada at the Battle of Lepanto.) 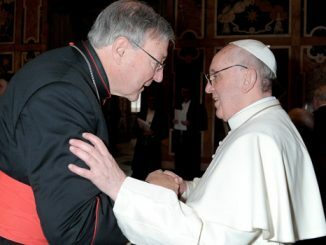 All of these facets of apostolate are artfully presented by Gossin while holding true to one of Dr. Carroll’s last wishes which was his hope that in the telling of his story, it would, “include no detraction” (p. xi). Finally, and charmingly, the book presents – particularly in its last pages – a love story. We live in an age which romanticizes to the point of exaltation the eros of ‘falling in love.’ Our ahistorical ‘youth culture’ idolizes and idealizes ‘love’ as something consisting solely of a rush of hormones. Gossin’s tender portrayal of Carroll’s last years, with many days perched on a chair in his wife Anne’s classroom reading a book while directing her to students with raised hands, touches the soul with the hope to be found in the true love of agape nurtured through a lifetime of matrimonial devotion. Perhaps the only flaw of One Man Perched on a Rock is that, too often, rather lengthy quotations (often from Carroll’s own works) are offered where a short summary of the thoughts presented would suffice. Particularly in our rapid-fire internet age, some might be tempted to ‘click’ past these quotations, to get on with the story. And if the reader so desires, this probably wouldn’t be that bad a thing. But for those with a bit more patience, these long digressions into the worlds Carroll created in his science fiction, the relationships he nourished in his personal letters, and the scholarship he presented in his historical works all offer a journey into a mind both unique and uniquely Catholic. Such a joyous attitude toward life gives context to the scenes Gossin peppers throughout the book showing Carroll to be not just an intellectual eclectic, but at times maybe just a bit of an eccentric. There is, for example, Carroll’s failed attempt at building a rabbit hutch. Or, his rather self-described “miserable” stint as an apiarist. Or, finally, his love for the game of Twister. One suspects at some point after Carroll’s conversion he came across Belloc’s rhyme, “Wherever the Catholic sun doth shine, there is much laughter and good red wine. At least I’ve always found it so, Benedicamus Domino,” and raised a toast in concurrence. One of Carroll’s favorite historical characters was a man named Pelayo who in the 700s, tradition tells us, launched the Reconquista to free Spain from the Moors by capturing a small patch of mountainous terrain. He would regale hundreds of students across the years with the tale always concluding with what for him was a central truth, “One man can make a difference.” In reading One Man Perched on a Rock, said title deriving from this tale of Pelayo, Catholics can be strengthened again in this belief. In this day and age of stifling indifference and overpowering nihilism, that is reason enough for reading the book. Thanks for this fine review, which has me enthusiastic for the book about Dr. Carroll. It seems a good companion to a biography I’ve already read about L. Brent Bozell Jr., “Living on Fire.” The latter book, as I remember it, doesn’t make a strong connection to the founders of Christendom College such as Dr. Carroll, but I’m hoping this newer book will help in this regard. The story from Bozell to Carroll is fascinating to me in the sense of being at least somewhat analogous to the daunting adversity and daring adventure of the above-mentioned Pelayo as the originator of the Reconquista of Spain (as artfully related in Dr. Carroll’s book, “The Building of Christendom”). As I understand it, the Catholics who rallied around Bozell and his wife at Triumph magazine were indeed an isolated band of Catholics seeking refuge from the secularistic Cultural Revolution of the Sixties, and beginning a spirited resistance. The poignancy of the book about Bozell is his nobly quixotic efforts to sustain the orthodoxy of Catholicism in the midst of this tumultuous time — with a courage to distance himself from the more comfortable and rewarding establishment conservatism of his brother-in-law, William F. Buckley Jr. The two had been the closest of friends beginning with their days at Yale, and became early collaborators in promoting an authentic conservatism during the 1950s. The subsequent strain in their relationship is heartbreaking, especially as both seem to have been good men who sincerely tried to be faithful Catholics. Indeed, it continues to be a grand endeavor of great delicacy to reconcile what is best in the American way with the transcendency of Catholicism — a challenge quite perilous, but eminently worthy. 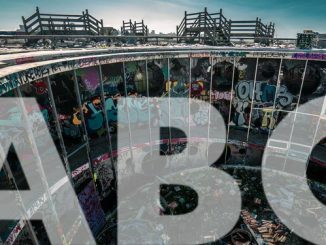 Like Bozell, I’ve had quite a struggle in my life trying to live Catholicism gallantly and gracefully in a culture that is often hostile to Catholicism, at times from inside the Church itself (although this may be due in large part to a certain cluelessness by people who are generally of good will). My clumsy journey with its comedy of errors goes back at least to Northwestern University in the early 1980s as an enthusiastic but awkward member of the tiny pro-life community. Since then, there have many misguided and painful stumbles (of cringeworthy reminiscence) in trying to be a Catholic witness in a society both disturbing and confusing. My quirky knight-errantry has been complicated (as in the case of Bozell) by what has turned out to be an infirmity of mental illness in my own particular case (not forgetting the self-inflicted impediments of my own peculiar sinfulness). Like the great movie, “Mr. 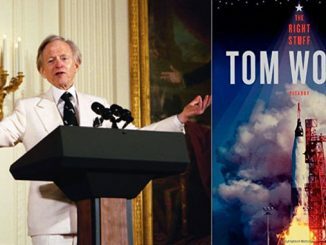 Smith Goes to Washington,” it seems life is a contest between soaring idealism and crushing reality — which is perhaps why Jesus told us to be both as wise as serpents and as innocent as doves. It was fascinating for me to read how this grand challenge played out in the life of L. Brent Bozell Jr. (with apparently an ultimate personal triumph); and I look forward to how it unfolded in the life of one of his inner cadre of Catholic stalwarts (which also found a place of retreat and refreshment in Spain) — Dr. Warren H. Carroll. May we continue their cultural reconquest of America for Jesus with earnestness and enthusiasm — as well as resilience, discernment, and a genuine sense of humor. Love covers a multitude of sins, as well as correcting many innocent missteps along the way. “Truth exists. The Incarnation happened. I am going to get and read his history of Catholicism. (And this book on him).